Having no time to cook demands that I have my meetings in places where I can eat and work at the same time. After a recent meeting which required me to venture forth to a part of Singapore I had never been to before, I took the opportunity to explore the shopping mall. Of course, the first place I headed for was the supermarket, which turns out to be a Cold Storage. Surprisingly, this one was fairly large with a much better selection than many of the surburbian supermarkets I've seen. The Causeway Point Cold Storage was even better than the very popular Holland Village Cold Storage in my opinion. I was pleasantly surprised although there is still no way I would ever travel all the way there just to do my shopping. In a shopping mall that size, I knew there must be a food court somewhere in the maze of shops. In most shopping malls, the food court would either be in the basement or on the highest floor. Gliding on the escalators, I descended to the depths of Causeway Point. The basement was the pit of food hell. There were only fast food joints and a couple of mediocre food franchises. I quickly climbed my way out, hopefully, to a better food haven. I was right. On the top most floor, right in the farthest corner, was the food court. There were the typical high ceilings, garish fluorescent lights and maze of chairs and tables. And the usual food stalls. It was not very inspiring and I did not see anything unique that stood out. Still, I was willing to check on the quality if not the variety of food. Any hawker centre is a food paradise to me. I picked a beef noodles stall to try out the fare at this busy shopping mall and food court. The food stall helpers were very friendly and generous with the bean sprouts when I requested for more. I don't know why but I always like ordering from nice old ladies at food stalls. They always make me feel all babied and pampered and they tend to be really nice which gives me a nice, warm glow that either enhances or disappears with the first taste of my meal. In this case, the service was a lot tastier than the food. 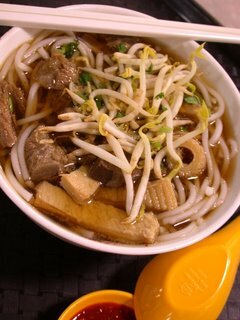 The beef noodles broth was decided bland and thin. It was healthy though as I could tell that no MSG was used at all - a rarity in hawker food in Singapore. 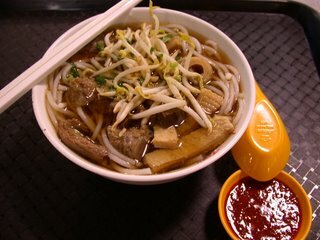 To get the true measure of beef noodles, you need to have it in a soup rather than the dry version with the thick, viscous gravy. The gravy usually covers up the multitude of sins the soup version relentless discloses. Another test is to have the mixed beef platter. Yes, you cringe but until you taste the tripe, the shin meat, the intestines and flank steak strips, you cannot get a proper gauge of the quality of the food. The flank steak strips were overcooked and dry. The tripe and intestines were fairly tasteless although still fairly tender. I could tell it had just been boiled in salted water instead of a flavoured, spiced broth. The shin meat was the only thing that still held some measure of flavour. But the real surprise lay in the chilli. It was thick enough to coat the meat lusciously yet thin enough to flow gently down the throat. 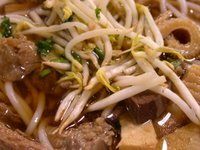 With just the right amount of spice, garlic, and scalded oil, it perked the appetite robustly and satisfied the hankering for heat in even this spice hound. Generously slathering the meat and internal organs with this delicious chilli made the meal a lot more appetitising. 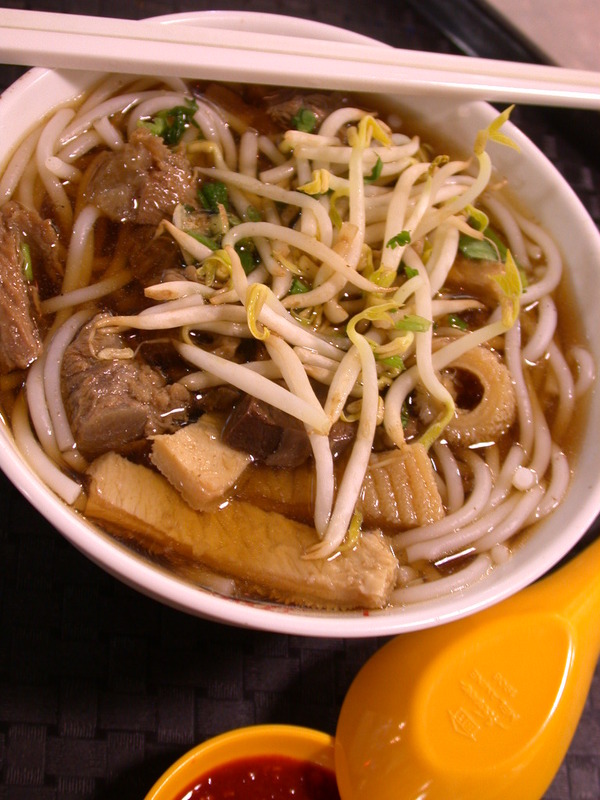 The beef noodles soup was an adequate meal if you are hungry and craving a semi-healthy option. But with so many other choices available in the food court, I would not go back again (if I do go back there again). 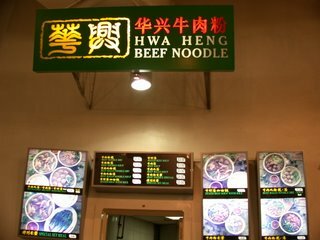 So, I give the beef noodles a 6.5/10 for taste and a 7/10 for health. But I would like to give a 8/10 to the two very nice stall helpers for excellent and genuinely warm service. What is it with malls and their inability to provide great food choices??? I have a really nice mall near my home that has a lot of high-end stores and yet there probably isn't one food place in there (other than maybe a bistro-type food place) that I would consider a great option to eat. You made some great points in that post, MM! Yeah, the basil ice cream was heavenly. I'd never had it before too and now I am craving it. It was sooooo good! Ivonne - Thanks! It makes me sad when I go to the US and eat at some of the mall food places. Not to be condescending but I really feel sorry for you guys sometimes. And so lucky to be in Singapore where the plethora of cheap and good food is just amazing. Karina - I am beginning to think that is the standard globally. Makes me sad. I live in Woodlands and we go to the causeway point food court often enough. I agree, the beef in the beef noodles are always too overcooked and tough. But sometimes I just want my beef noodles. Two stalls we frequent with food that's quite reliable are the pseudo-Korean stall for its kimchee soup, and the boiled soup stall for its herbal chicken and meicai kourou rice. Hey Mumu, thanks for visiting and commenting! I only ever go to Woodlands if I am on route to Malaysia so it was my first time at Causeway Point. If I end up there again, I will make a point of trying the herbal soups. Thanks for the tip!